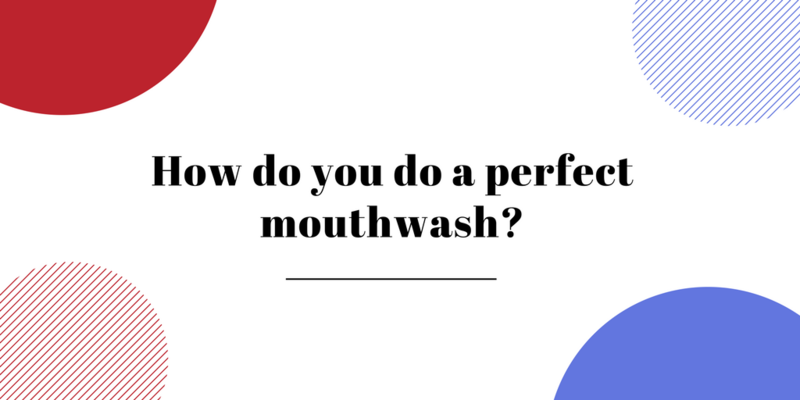 How do you do a perfect mouthwash? Why do you need a perfect mouthwash? Plaque removal (a thin layer of bacteria caused due to deposition of food particles). Stop formation of calculus (thick band around the teeth due to hardening of plaque which goes off only by professional scaling). Reduce the chances of gum disease (gingivitis). Antiseptic agents- include chlorhexidine gluconate, triclosan, betadine, etc. Antiplaque agents- include hydrogen peroxide, zinc, and calcium. Anti cavity agents- include fluoride. Anti mal-odor agents- include sanguinarine, cetylpyridinium chloride. Phenolic compounds with anti bacterial properties include- thymol, eugenol, menthol, eucalyptol, etc. Flavoring agents- include sodium saccharin, xylitol, sucralose and sorbitol. Astringents – include alum or zinc chloride to make the mouthwash pleasant to taste. Other agents include- sodium lauryl sulfate, benzoic acid, methyl salicylate, salt and water. Using the right amount- one can be ensured of using the correct amount by using a dispenser. These are available at various stores. Take around 20ml or as instructed by your dentist in the dispenser for a perfect mouthwash. These mouthwash dispensers also prevent in spillage and wasting of the mouthwash. Dilution if required- though diluting the mouth wash decreases its effectiveness, but it is absolutely up to you. Make a perfect mouthwash by slightly diluting with water. Time- you should watch the clock carefully for about 30 to 60 seconds and then spit the mouthwash. Gargle the mouthwash- keep the mouthwash back in throat and gargle for 30 to 60 seconds so that the bacteria’s get killed. Rinsing- It is absolutely one’s personal choice whether to rinse mouth after using a mouthwash or not. Some people spit the mouthwash and rinse while others don’t as they think the protective layer formed gets washed away. Not a substitute of regular oral regime- mouthwash is not a substitute of daily brushing and flossing. It is rather an addition to them for better oral care. How can you straighten overlapping teeth? What to expect when getting braces? What is the meaning behind the symbol of dentistry? What is inside your mouth beyond teeth? What are wisdom teeth and why are they removed?